This rich, moisturising paw paw body wash provides a natural cleansing that leaves the skin soft and smooth. The natural ingredients cleanse and refresh both skin and pores without drying or damaging the delicate surface of the freshly exfoliated skin. 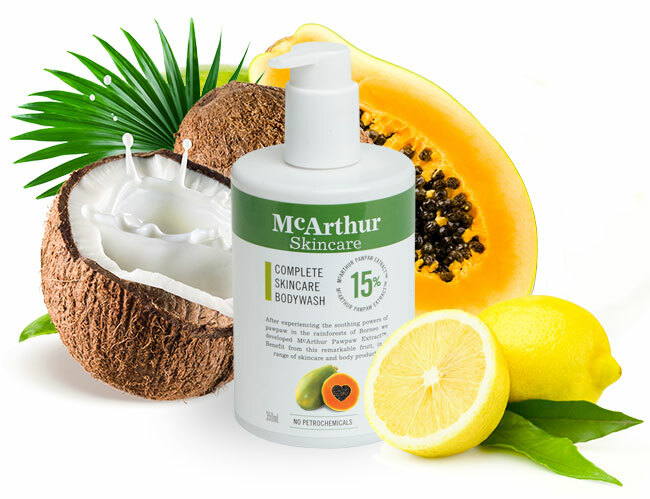 McArthur Skincare's Complete Skincare Body Wash is a luxurious, exfoliating cleanser which contains 15% McArthur Pawpaw Extract™. It is suited to all skin types and is ideal for sensitive skin. Protect your skin by cleansing with safe, natural ingredients. Pawpaw (Papaya, Paw Paw) is the skin’s natural friend, packed full of vitamins, antioxidants and enzymes which give it a natural ability to restore lustre to the skin and improve skin tone. That’s why at McArthur Skincare we have incorporated high concentrations of this amazing paw paw fruit into our Complete Skincare Body Wash. It is the ideal way to safely refresh and revive the skin and body, leaving a fresh feeling on the skin. McArthur Skincare's Complete Skincare Body Wash has been formulated to soothe and moisturise the skin. All harsh additives have been excluded. It contains no parabens, sodium lauryl sulphate or propylene glycol. 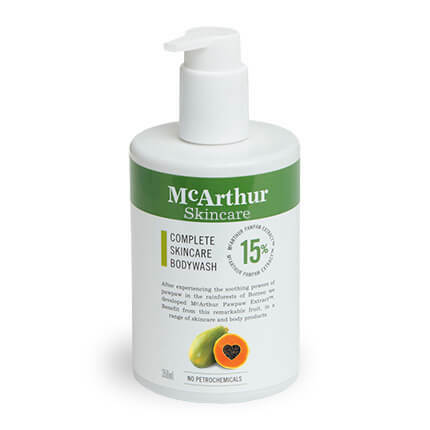 McArthur Skincare's Complete Skincare Body Wash provides an effective paw paw body wash that uses natural ingredients - to provide a fresh purifying clean. Please keep McArthur Skincare's Complete Skincare Body Wash stored at a temperature below 30° Celsius.